Sekolah Lentera Kasih seeks to provide a nurturing and challenging environment for our nation’s future leaders. We strive to develop and provide a constantly growing educational program dedicated to academic excellence and character building. Deliver an international standardized education that is geared to meet the needs of the students in the 21st century. Sekolah Lentera Kasih (SLK) and Lollypop Preschool (LLP) Bali is an accredited national private school and registered at Ministry of Education as an SPK school where this license permit us to implement the Cambridge Program. We aim to prepare and equip students with the knowledge, skills and godly values to become future leaders who are ready to compete and face the global challenges. 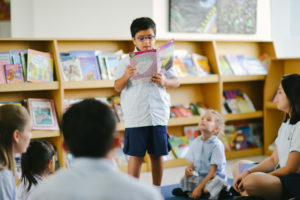 The school is based on Christian Education principles and values. We welcome students of all religious backgrounds and ethnicities. The learning environment is fun, creative and implements the current and innovative teaching method that would help students to grow as a whole child/individual: intellectually, emotionally, socially and spiritually. We constantly strive to build and develop educational programs with a focus on the academic excellence as well as the development of character building. We believe that every student is unique, valuable and deserves to get the best education. They should have the opportunity to do their best in learning, develop any positive potentials they may have and able bring a change not just for themselves but also the world. Lollypop Preschool program prepares students to learn independently, know the school system and its environment, begin to understand and love learning, and prepared to continue their education at a higher level. We provide classes for Toddlers, Nursery, Kindergarten and Preparatory. Sekolah Lentera Kasih (SLK) consist of Primary Level (gr 1-6), Secondary Level (gr 7-9 ) and Junior College (gr 10-12). We implement the National /Indonesia Curriculum and CambridgeCurriculum: Checkpoint gr 6 and 8,IGCSE, and A Level. With a loving environment and good cooperation with parents as school’s partner in children’s education SLK and LLP will achieve its ultimate goal of learning at LLP and SLK : Building Character and Academic Excellence. Make the right choice for your children’s future.